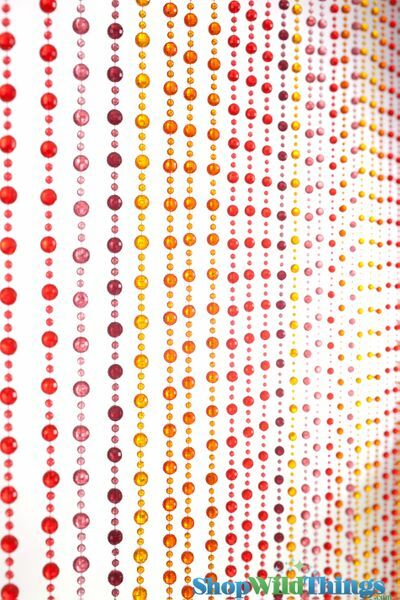 This awesome beaded curtain has a ton of fun color: oranges, orangy/plum reds and yellows. This curtain measures 35" x 72" and has 34 NON-Iridescent strands of beads (no pearlized coating)...the beads are see-through and have little disco-ball type of faceting. Beaded Curtains are the hottest design trend out there right now. Use them in a doorway. Use them in the windows. Use them behind a bed suspended from the ceiling. Leave them hanging down, or tie them to the side like a regular window treatment. Place two or more right next to each other, they will look great to cover a wider space. 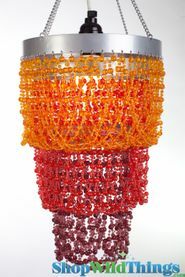 Add some wonderful color and fun to any room today with a high quality beaded curtain from Wild Things. We deliver. I bought 2 and l liked them so much that I reordered 3 more. They are neat, good quality for the price. Don't forget to claim your 10% rebate to help with the shipping if your order is less than $100.00. Terrific curtains & Terrific customer service & Terrific price! I can't say enough about how lovely these look in a doorframe that no longer has a door. The dominant colors are orange & gold with some dark burgundy strands. There are not any really true red beads so I am ordering another set of just red to hang with this and I anticipate they will sparkle & shine just as these do. I am thrilled to have found this retailer that has just what I wanted & needed at a price I could afford. Installation was simple & I couldn't be more pleased with the look! Merchant Response:Thank you so much for your comments! We are so happy that this is working so well for you. We love the ease of use with the beaded curtains too. It is so nice to have a quick easy solution to add a little color and bling to any room or event. ProsEasy to install. Reasonably priced. Very nice quality! really cool so glad i decided to buy this! This bead curtain is quite pretty - very nice color combo. The curtain was very easy to install and is actually quite a bit sturdier than I anticipated. I purchased two of these to cover a wide closet doorway. Rather than cutting these down to fit half the doorway each, we left them at full width and overlapped them, which makes for a darling look when the curtains are tied back. ProsPretty colors Sturdy Simple installation Fast shipping, too. I purchased two sets of these beaded curtains to place between my living room and dining room and it has been the perfect finishing touch after my rooms were painted. An inexpensive way to make a room pop. They look incredible. EZ hang. We love the effect, added warmth and decorator charm to the room. Thanks for the great service. Was delivered in a timely fashion. Looks good and is just what I expected. Went up quickly and easily. ProsIs strong enough to last a long time.